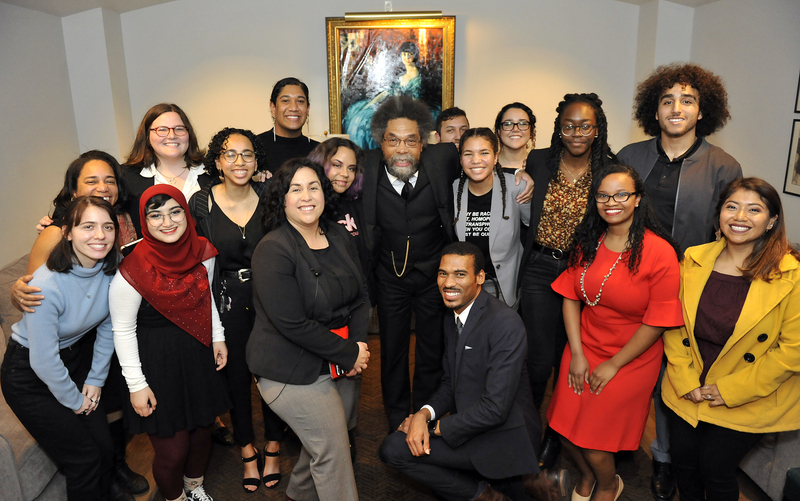 Renowned professor, philosopher, author and activist Cornel West captivated hundreds of campus community members at two separate events Wednesday, Jan. 16, including a student-focused “fireside chat” and the second annual Dr. Martin Luther King, Jr. dinner. Cal Poly’s inaugural MLK Legacy Award was also bestowed during the dinner to College of Science and Mathematics Associate Dean Camille O’Bryant, professor in the Kinesiology and Public Health Department. The award recognizes a campus community member who upholds the legacy of Martin Luther King, Jr. by leading with love and hope to create a better campus for all. 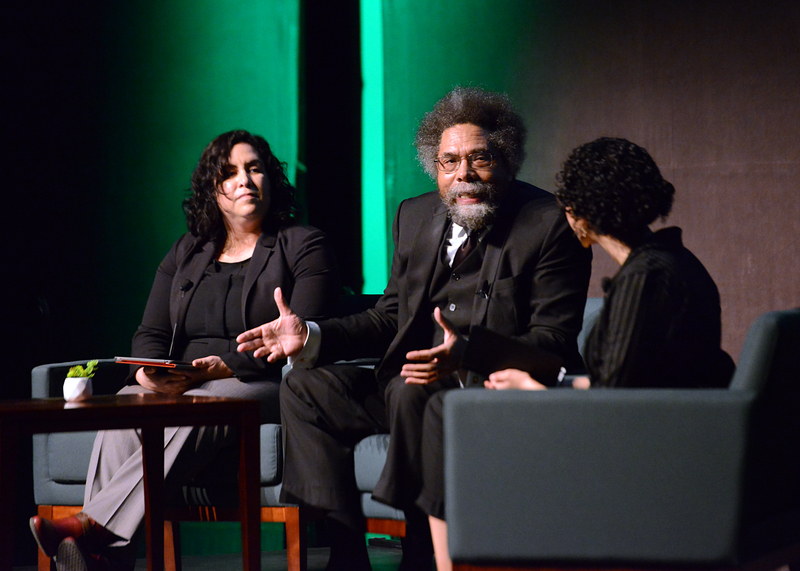 The individual is also integral to creating a legacy at Cal Poly that centers on diversity, equity and inclusion, said Bryan Hubain, assistant dean of students and director of the Cross Cultural Centers, which organized the dinner in Chumash Auditorium to honor King and raise awareness about the lives and experiences of people of color at Cal Poly. The Cross Cultural Centers and the Office of University Diversity and Inclusion (OUDI) hosted the fireside chat in the Performing Arts Center Pavilion. Love — particularly transforming love into moments of unity and lifting up fellow humanity — was a common theme throughout West’s thought-provoking talk. In his smooth, melodious tone, West touched on black traditions, death and living, politics, the legacy of King and the many others in the black community who preceded him and succeeded him in finding their own voices to cut against the grain and empower others. During the fireside chat, West also opined on topics ranging from global issues facing society and the government shutdown to the current state of rap music and rejecting hate in favor of being a “love warrior.” Watch the video of the chat here. “I come from a black people whose anthem is lift every voice, not every echo,” West said, referring to polarization in politics and what he described as politicians echoing talking points, not raising distinct voices. The whole nation, West said, can learn something from the best of people, like King, who have been hated. In response to a question about what advice he’d give Cal Poly students seeking to make a difference, West said: “The issue is what kind of human being you’re going to choose to be in the short time you have from your momma’s womb to tomb.